Informally known as the Bakelite telephone, the sculptural Ericsson DBH 1001 was a groundbreaking design that set the standard for the shape of the modern plastic telephone. The telephone was a collaborative project between the Electrisk Bureau of Oslo, Norway and the Swedish firm LM Ericsson and Televerket. In 1930 Ericsson hired engineer Christian Bjerknes for the mechanical elements and artist Jean Heiberg to design the housing, and chose to use the new thermoplastic, Bakelite. Until that time, telephone housings were made of pressed sheet metal. The result was the DBH 1001, the first telephone with an integral cradle, dial, and ringer. 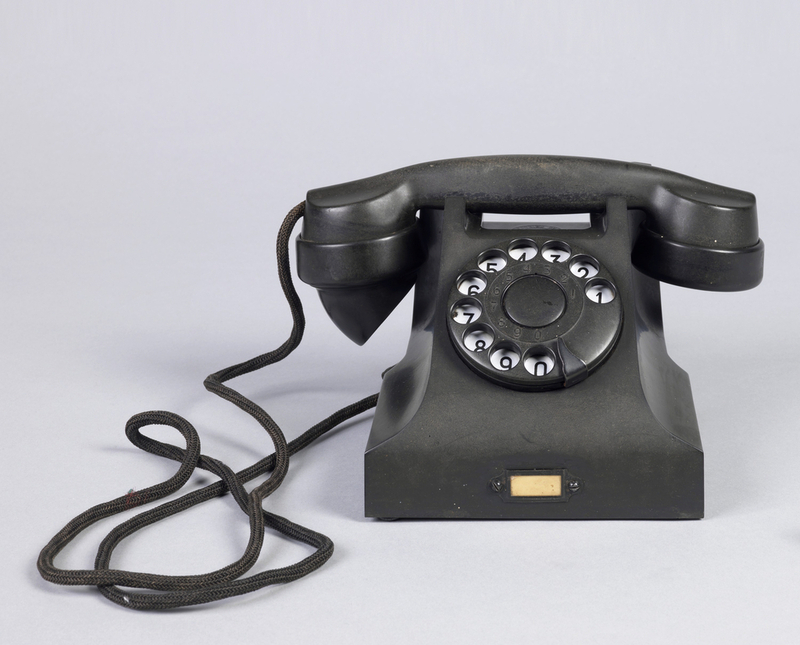 Bakelite was an ideal substance for electrical devices like telephones, in part because the tough, durable material could be molded into any shape. The shift from metal to Bakelite was a revolutionary cost-cutting manufacturing move, reducing production time from about one week to under ten minutes, the time it took for a Bakelite housing to cure and be expelled from its mold. Consumers appreciated Bakelite’s other practical advantages—it is lighter and more comfortable to handle than metal, impervious to moisture and the heat of electrical components, and is easy to clean. Heiberg’s streamlined telephone reflected a minimal, sophisticated modernist aesthetic that emphasized function. The one shortcoming was color. Bakelite could be produced only in black or dark brown with a lustrous, lacquer-like surface. While the American company Automatic Electric produced a Bakelite telephone in about 1925, its cradle was still made of metal. Heiberg’s design integrated the cradle as part of the molded sculptural body, while the ergonomic contours of the molded receiver were easier to grasp and hold than earlier metal receivers. The DBH 1001 was a hit with the telephone industry and with consumers in Sweden and elsewhere. Ericsson sold the phone to foreign networks. In much of Europe the phone was called the Swedish-type telephone. It also had an impact on American design, influencing the form of Henry Dreyfuss’s model 300 series for Bell Telephone, introduced in 1937. In 1939 Ericsson showed a transparent version of the DBH 1001 at the World’s Fair in New York. Variants of the DBH 1001 remained in production until 1962. Telephone (Norway), 1931. Designed by Jean Heiberg and Christian Bjerknes. Molded Bakelite, sheet metal (chasis), woven textile (cord). Gift of the Kunstindustrimuseet i Oslo. 1992-118-1.